BIG SALE!! 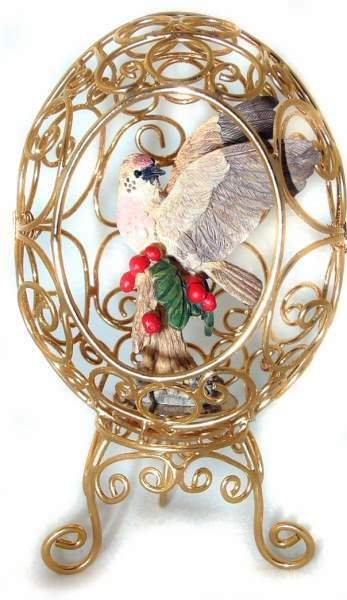 COLLECTIBLE FIGURINES BIG SALE!! Large exquisitely hand painted Eliza Doolittle style Victorian flower girl figurine. Smiling bright eyed girl with feathered hat and a basket full of red roses and more on the side. 10" H x 6" W x 5 3/4" D - 1lb 6ozs. Certified and numbered by the Hamilton Collection, "Feather-Woman" is a creation of award-winning artist Alessandro Biffignandi. Presented on fine porcelain and limited to 28 firing days, hand numbered on the reverse #1832A, as well as the Certificate of Authenticity. Complete your collection or replace a broken piece. 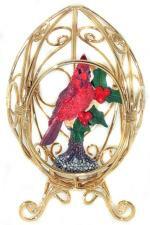 Hand painted Cardinal bird on Holly leaves in gold tone gazebo egg a 1995 offering from Franklin Mint. Complete your collection or replace a broken piece. Brand new in original box. 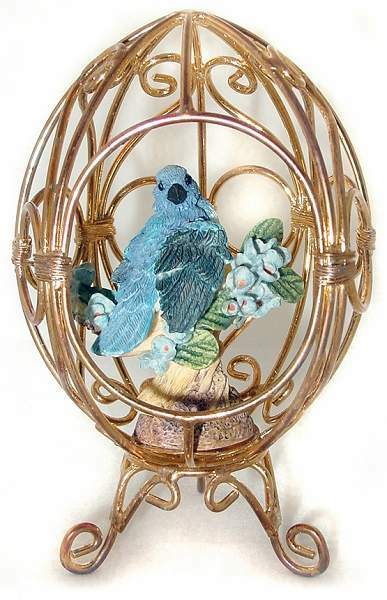 Hand painted Indigo Bunting bird in gold tone gazebo egg a 1995 offering from Franklin Mint. Complete your collection or replace a broken piece. Brand new in original box. Hand painted Redpoll bird with Holly berries in gold tone gazebo egg a 1995 offering from Franklin Mint. Complete your collection or replace a broken piece. Brand new in original box.